ISKCON Aravade is a place situated in the midst of many pilgrimages. 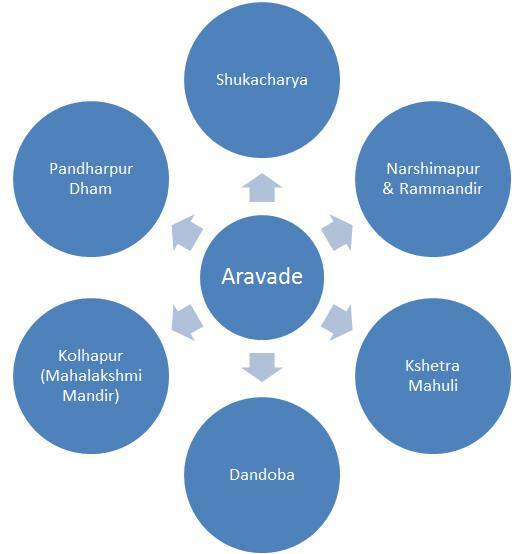 Lord Chaitanya Mahaprabhu travelled by this way towards Pandharpur. Also this is birth place of H.H.Lokanath Swami Maharaja. In this place there is a fresh air, nice hills, and nature’s presence. 1. North- Shukacharya (Shukdev Goswami’s austerity place) and Pandharpur Dham (Place of Vitthal Rukmini). 2. East- Dandoba (Ram Cave place) and Ghatshila (Ram seated on big stone). 3. West- Narsimhapur & Ram Mandir (JwalaNarsimha TirthKshetra), Audambar (Lord Dattatrya’s place) and Sri Kshetra Mahuli. Pandharpur Dhama is the beautiful holy abode of Lord Vithala, Sri Krishna Himself. Located in South-eastern Maharashtra, Pandharpur Dhama is the spiritual headquarters of Maharashtrian bhaktas. 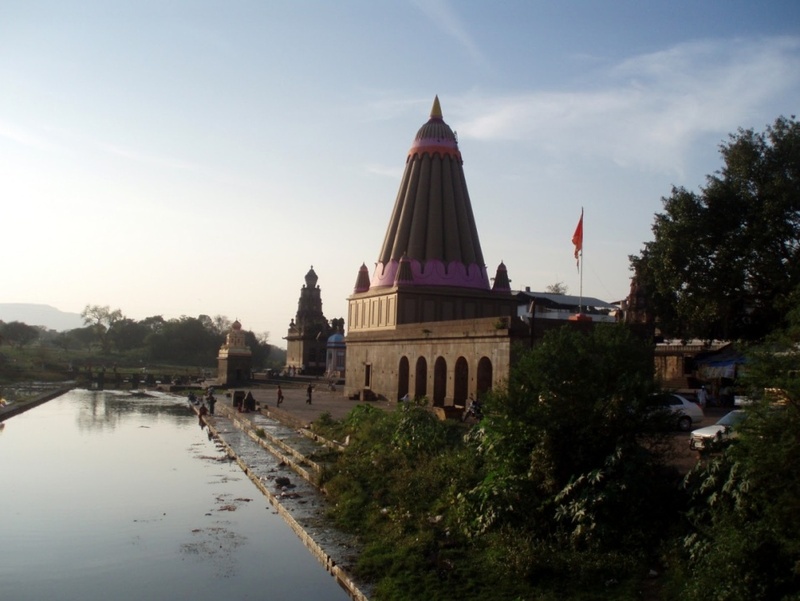 Sri Chandrabhaga River usually gently curves around the town of Pandharpur in a crescent half-moon shape, thus her name Chandrabhaga which means “half-moon”. 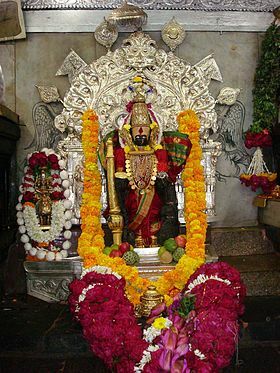 The worship of Vitthal in the Pandharpur temple is based mainly and the centre of the Vaishnav saints of Maharashtra and Karnataka during the the 13th through the 17th centuries, namely, Dnyaneshwar, Namdev, Eknath, Tukaram, Purandar Das, Vijay Das, Gopal Das, and Jagannath Das, have augmented the worship. 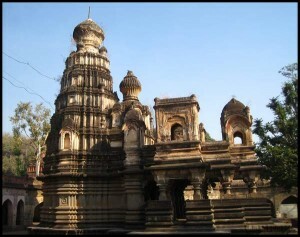 The Pandharpur temple covers a large area, and has six gates. The eastern gate is known as the “Namdev Gate”. Pandharpur hosts four annual pilgrimages (Yatras) of Hindu devotees. Among them, the pilgrimage in the month of ashadh in the Hindu Shaliwahan Shak calendar attracts the largest number of pilgrims around 0.5 to 0.7 million people. The pilgrimage in the month of Kartik attracts the next largest number of pilgrims. In ISKCON Pandharpur resides Sri Sri Radha Pandharinath with there Cows, Farms and Devotees. sixteen handed form of the Lord standing on one foot has been the protector and benefactor of his reverential devotees for thousands of years. The local tradition related to this deity has been compiled in a book known as Krishna Mahatamaya. The foremost amongst the sages, Parashar, performed austerities on the bank of the river Krishna with a heart full of devotion, meditating on Lord Nrsimhadev. According to the local tradition, Lord Nrsimhadev was pleased with the devotion of Parashar Muni and hence appeared in a wonderful sixteen-handed form. This was the same blazing form that the Lord had assumed while killing Hiranyakashipu. Seeing that it was not possible for anyone to establish this ferociously blazing form on earth, the Lord ordered Parashar Muni to immerse him in the river Krishna. With a heavy heart, the sage immersed the deity in the water. Centuries later, around the year 178 A.D., a Brahmin couple staying at a village named Anjana had been cursed to become blind and dumb by a sage. On begging forgiveness, they were advised by the sage to perform austerities for the pleasure of Lord Nrsimha to absolve them of the curse. After twelve years of rigorous austerities, the Lord appeared in their dreams and told them that he now wished to establish himself on earth as a deity and asked them to approach the local king named Bhimadev to get him out of the river. When asked how they would find the exact location where he was under the water, the Lord told them to place some dry kuça grass in the stream and that they would find him exactly under the place where the grass caught fire. After that darçana of the Lord, the couple immediately regained their sight and speech and set off to inform the king. On hearing the request of the couple, the king sent his entourage to discover the deity. While searching in the river according to the procedure specified by the Lord, one of the blades of grass caught fire and the wonderful sixteen-handed form of the Lord was discovered from the depths of the river. 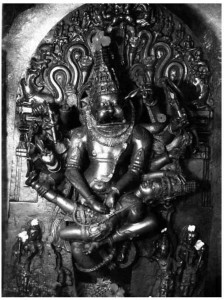 On examining the deity, the devotees could see that the Lord was positioned with his left leg raised and bent in order to place the demon Hiranyakashipu upon it, and also to hold the left arm of the demon to prevent him from escaping. His other foot was placed firmly on the doorstep of Hiranyakashipu. On the left side of the Lord were small deities of Lakshmi-devi and Prahlad Maharaja. On the right side were deities of Bhudevi (the earth goddess) and Garuda. All around the form of Lord Nrsimha were wonderful carvings of the famous dashavataras, ten incarnations of Lord Krishna. Most of these carvings can be seen even today. Unfortunately, the carving of Garuda has been lost and two hands of the Lord have been separated due to rough handling. These two hands have been preserved at a pujäri’s home nearby. Jwala Nrsimha has been worshipped since then with great pomp and reverence, and was visited by many prominent saints of Maharashtra. The current temple structure was built under the guidance of Hemadri Pant, the disciple of the great vaishnava scholar Vopadev and commentator on Vopadev’s magnum opus entitled Muktä-phalam. Hemadri Pant was an expert diplomat, administrator, poet, theologian, and scholar. Mentioned by Srila Jiva Goswami in Tattva-Sandarbha as a historical authority, Hemadri Pant held the position of minister in the court of King Ramachandra Dev of the Yadava dynasty of Maharashtra. It was under the guidance of Hemadri Pant that the temple was constructed by the King in 1273 A.D. 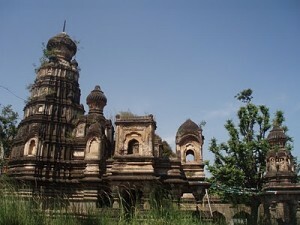 The architecture of the temple is of a unique style named after Hemadri Pant, which relies on usage of locally available raw material. The temple has two main doors — one on the northern side and another on the eastern side. Visitors generally enter through the eastern door. The deity is located 14 feet under the ground, and in order to reach there one has to climb down steep staircases and pass through narrow tunnels many of which are under several inches of flowing water from the nearby Krishna river. The temple complex contains a painting and Samadhi of a siddha mahatma named Sri Siddheshwar Maharaja. Holy river Krishna moves towards South direction , on the southern part of village shiv ling was installed by Lord Rama so called Ramlinga; To avoid interruptions from Krishna water , in meditation of lord Rama , Hanuman restricted the water with his arms (bahu);and Krishna river bifurcates here., the same concept was considered by Ramdas Swami & he installed idol of Hanuman, so called Bahe Maruti. 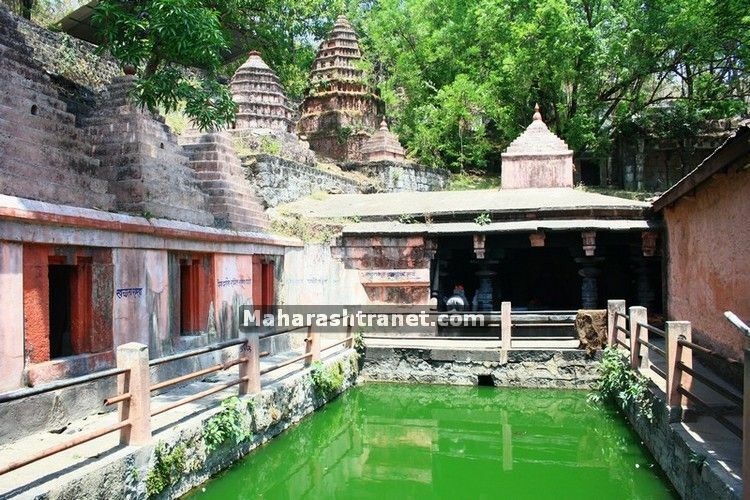 Here is also a Shrines of Holy Sages, Shrine of Markandeya on Pavangad, Shrine of Muchhkunda on Vishalgad, and Shrine of Parasher on Panhalgad. Keshavraj was found with deities of narsimha and was installed at the west bank of river at Tambve dist. sangli. ; while deities of goddess Koljai placed on north bank of Krishna river at village Kole Gram. On the other hand Pimplai devil idol was placed at Rethre budrug. Al deities are worshipped as a ‘Gramdaivata’. This is very famous pilgrimage for vaishnavas. The great acharya Bilva Mangala Thakur was residing in this place and also He wrote the famous book Krishna Karnamrita here. When Chaitanya Mahaprabhu traveling all over India, he came here and found Krishna Karnamrita book. This is the book which Chaitanya Mahaprabhu likes very much. Two rivers joining at this Location named Krishna & Venna. This village earlier was part of ‘Aundh Princely State’. There are 3 well known temples around the convergence of the rivers viz: Vishveshwar, Sangameshwar & Rameshwar. The other side of the river Krishna is called Kshetra Mahuli. Kshetra Mahuli is one of the Villages in Satara Taluk in Satara District in Maharashtra State. 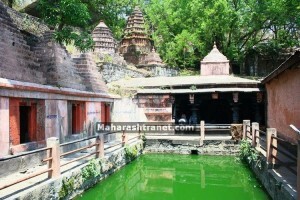 Kshetra Mahuli is located 5.3 km distance from its Taluk Main Town Satara. Kshetra Mahuli is 6.2 km far from its District Main City Satara. It is 196 km far from its State Main City Mumbai. 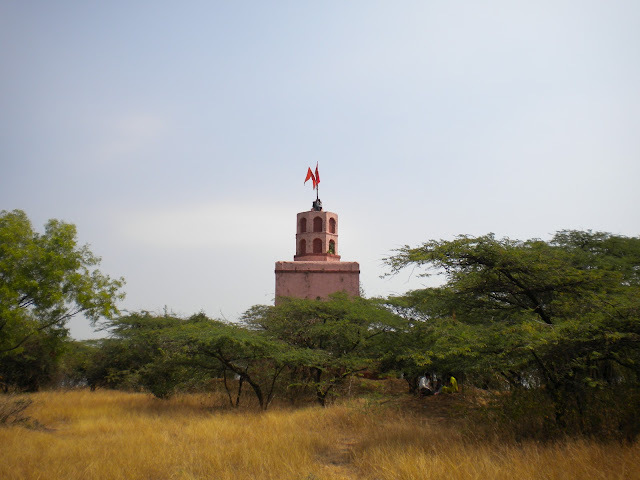 This is very famous temple of Maharashtra which is situated at west side Of Iskcon Aravade. This is temple of Mahalaxmi, which is incarnation of Srimati Radharani and she is external potency of Lord Krishna. This is described in Chaitanya Charitamrita that Lord Chaitanya Mahaprabhu himself came here and had taken darshan of Mahalaxmi. The Shri Mahalakshmi Temple of Kolhapur in Maharashtra, India, is one of the Shakti Peethas listed in various puranas of Hinduism. According to these writings, a Shakti Peetha is a place associated with Shakti, the goddess of power. 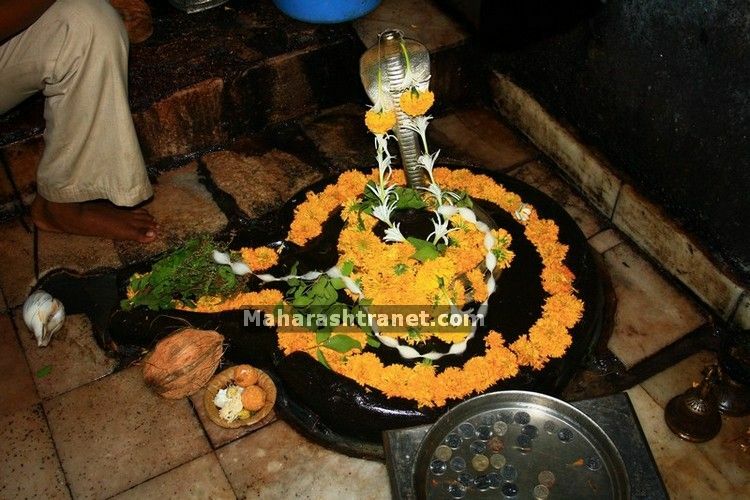 The Kolhapur Shakti Peetha is of special religious significance being one of the six places where it is believed that one can either obtain salvation from desires or have them fulfilled. The temple takes its name from Mahalakshmi, the consort of Vishnu, and it is believed that the divine couple reside in the area. The temple belongs architecturally to the Kannada Chalukya empire and may have been first built in circa 700 AD. Mounted on a stone platform, the image of the four armed and crowned goddess is made of gemstone and weighs about 40 kilograms. 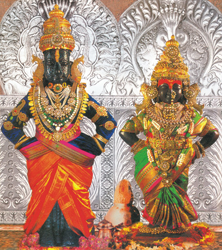 The image of Mahalakshmi carved in black stone is 3 feet in height. The Shri Yantra is carved on one of the walls in the temple. A stone lion, the vahana of the goddess, stands behind the statue. The crown contains an image of the Sheshnag — the serpent of Vishnu. In Her four hands, the deity of Mahalakshmi holds objects of symbolic value. 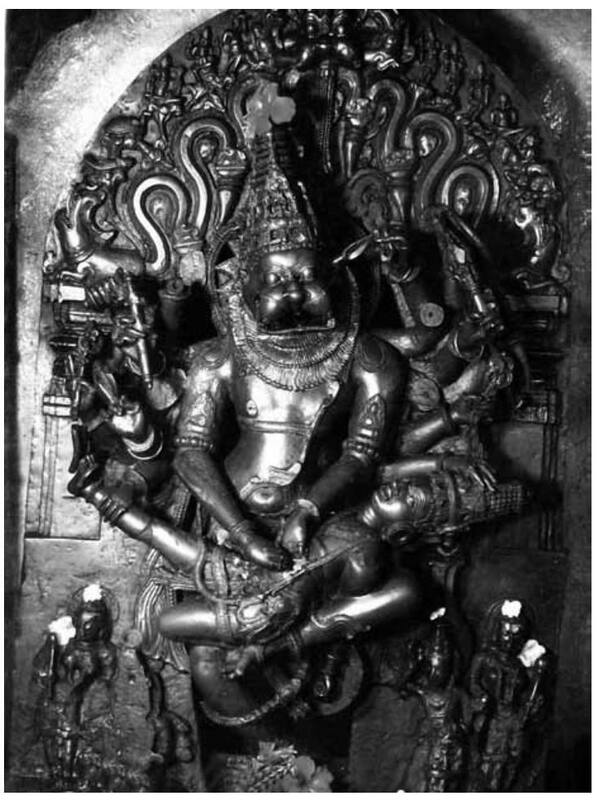 The lower right hand holds a mhalunga (a citrus fruit), in the upper right, a large mace (kaumodaki) with its head touching the ground, in the upper left a shield (khetaka), and in the lower left, a bowl (panpatra). Unlike most Hindu sacred images, which face north or east, the image of this deity looks west (Pashchim). There is a small open window on the western wall, through which the light of the setting sun falls on the face of the image for three days around the 21st of each March and September. There are a number of other shrines in the courtyard to the Navagrahas, Surya, Mahishasuramardini, Vitthal-Rakhmai, Shiva, Vishnu, Tulja Bhavani and others. Some of these images date back to the 11th century, while some are of recent origin. Also located in the courtyard is the temple tank Manikarnika Kund, on whose bank is a shrine to Visweshwar Mahadev. Worship Structure: Five worship services are offered each day. 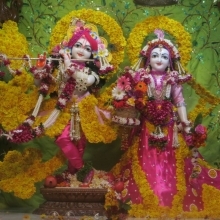 The first one is at 5 am, and it involves the waking of the deity with a Kakada – torch, to the accompaniment of hymns. The second worship service at 8 am involves the offering of the Shodashopachara puja consisting of 16 elements. The afternoon and evening services and the Shejaarati puja constitute the three other services. 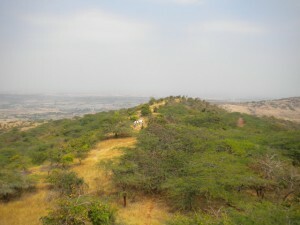 This is hill place situated on east side of Iskcon Aravade. Here are few caves. In one of cave Ram, Laxman, Sita had resided. This is holy place where so many people come on yatra. Also in one cave there is Shivling. 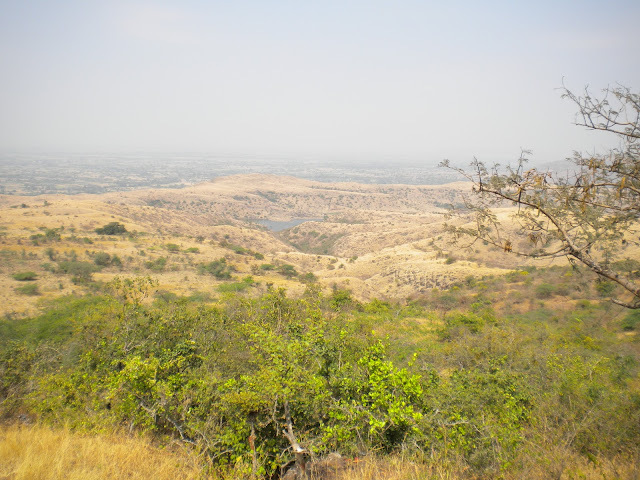 This is very beautiful place situated on north side of Iskcon Aravade. It’s very fresh and spiritually empowered environment. Here, Shukadeva Goswami had done great austerity in the cave of this place and then as soon as Indra got this news, he immediately disturbed about his position and immediately he sent the apasra Rambha to break his austerity then Rambha came in this place and started dancing and was trying to attract by her bodily features. Shukadeva Goswami who is the great devotee had not agitated or disturbed and he turned back to her and then finally she was defeated. So this is such place where the devotees can take darshan of back part of Shukadeva Goswami in that cave.